If you're interested in submitting your Community Voice click here. There is a difference between moochers and panhandlers. Moochers are people you know that don't pay their fair share of something, and panhandlers accost you and beg you for money, food or even gas for that matter. Letter to the editor: Love those gas prices yet? Letter to the editor: Send in the clowns? When folks think of Adventist Health, it’s likely they think only of the hospital. I can’t blame them. Opening a state-of-the-art hospital in a rural community is a feat — especially during a time when rural hospitals across the nation are cutting services and, in many cases, shuttering altogether. Every eight minutes, American Red Cross volunteers meet a family devastated by a home fire or other disaster. When a family has lost nearly everything, they rely on generous Red Cross supporters for relief and hope. I'll bet a dollar to a doughnut that most vandalism at our parks is caused by teenagers who have nothing better to do then get their jollies off destroying public property. I saw my fair share of vandalism/graffiti as an assistant high school principal. The purpose of this letter is to address the concerns and impacts to residents in the city of Tehachapi regarding proposed ordinance 8.68 addressed to the Tehachapi City Council on March 4. I received through the mail today a letter/survey asking me how I was going to vote in the next election. In the first place, it's no ones business how I vote in any election. It's my Constitutional right as an American to vote however I want. “c u soom,” By rear ending a vehicle, the typo was made. I want to thank the two gentlemen who picked me up when I fell down in the parking lot of Country Oaks Baptist Church. I ended up with surgery for a right fractured hip. Legendary radio broadcaster Paul Harvey had a well-known feature that was heard by millions of Americans on radio stations across the country each week. It was called "The Rest of the Story." Our City Council meetings have become a kangaroo court. Motorcyclists should avoid Highway 58. Tehachapi is such a kind and generous community, and the Salvation Army is extremely grateful. During the Thanksgiving and Christmas holiday season, we had several events including the Thanksgiving food baskets, Christmas food baskets, Angel Tree children’s toy drive, kettle drive and coat drive. All of the dancers from J&M Dance Company would like to thank Hungry Howie’s Pizza for their support letting our team fundraise with them! It’s amazing to live in a small community where there is so much local business support! Thank you Howie’s! Letter to the editor: Why are there cops on campus? Maybe it's bad timing on my part, but every time I drive by Tehachapi High there's a cop car parked in front of the campus. The police chief told me that they have a contract with the school district to provide protection, but this police protection doesn't come cheap these days. There’s no doubt Tehachapi’s parks are a major asset to the community. From quality of life enhancement to health benefits, our beautiful parks make life in the mountains more complete. I read with interest the article “City taking steps to boost local economy” (Feb. 27). The growth in the city brings with it the need for a lot of things. I didn’t see mentioned the need for more roads, schools, police and fire protection. Have you driven on Highway 58 or around town lately? Funny, or not so funny, I see the "city," whoever that consists of these days, saying they are going to do things to boost the economy of the city. And once again, I see the city is planning for things that attract people to come from other cities to spend here every so often. In the Feb. 13 Letters to the Editor ("Drugs force grandparents to become parents, again"), Jean Riesen makes the case for building a wall to stop the drug problem. Let’s take a minute to unpack this complex problem that has no simple solutions. I had heard multiple comments over the last few months that it doesn’t snow in Tehachapi “like it used to” or like “when I was a kid.” I know my former classmate Jon Hammond even wrote about that sentiment recently as well. Thanks Jon, it seems like it hasn’t stopped snowing since. Recently, City Manager Greg Garrett gave a presentation themed Moments that Mattered. When our Mayor, Ed Grimes, passed away, it was a moment that severely impacted us. Ed’s life and contribution to Tehachapi was extraordinary. Well folks, I must say I had mixed emotions about the Walmart coming to our little town, but now I realize that we are growing fast. So what are the pros and cons.? During Thursday morning's rain and wind, I was getting items from the trunk in front of Stone Mountain on Golden Star. The wind grabbed a cloth bag and took off with it. I tried to catch it, but the wind was at least twice as fast as I. So folks, watching the weather, or the news nowadays, is like looking at the Miss America pageant. These young lady newscasters look like they just graduated from high school, and they're still wearing the same hairdo from their yearbook. O.M.G.! You're not teenagers anymore! The fact that another letter writer ("Socialism in America," Feb. 13) believes he can explain the benefits of socialism by citing examples from 1635 and 1930 in six paragraphs is both humorous and naive. Well folks, you're turning 60 and retirement is just around the corner. You are so looking forward to traveling, and just working in the yard, or working on your projects or hobbies. I am writing to thank Tehachapi residents for sharing the true meaning of Christmas with children in need this past holiday season. Letter to the editor: Are political polls really accurate? I realized my doubts about polls were correct as the 2016 presidential race unfolded. All the networks and talk news shows quoted specific polls with one candidate almost assured of winning. Some individuals speculated that an upset might happen, but pretty much tongue-in-cheek. 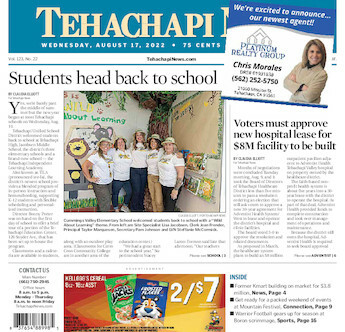 Letter to the editor: Tehachapi earns safest city? The Republicans have delayed the House Intelligence Committee by not providing any members to sit on the committee, thus proving they are covering any investigation into the Trump administration wrongdoings, during the campaign as well as actions taken since he has been president. What, more hamburger fast-food places coming to Tehachapi? We don"t have enough of them?